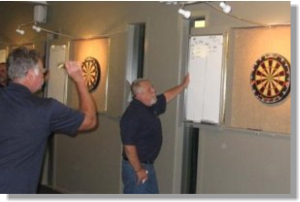 Competition and Social Darts are played on most Thursday nights in a warm, very friendly environment, commencing at 7.30pm. Four competition boards have been specially fitted and installed to professional standards. 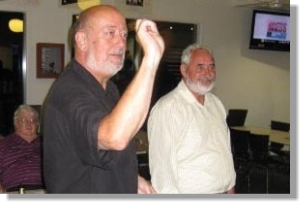 Games are played in air conditioned comfort and a games night has never been abandoned due to inclement weather. A great bar facility and fully equipped kitchen for supper preparation makes for a very convivial atmosphere which is enjoyed by all. Spring competition (July – Dec). good and average players play alongside each other. There is an annual individual club Championship open to all club members. 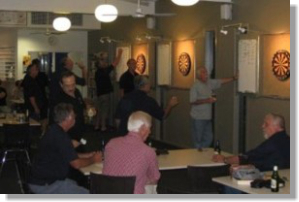 Whilst competition is serious enough for the dart enthusiast, the element of fun is foremost in the mind of all competitors. So come and join this very sociable group – cost is minimal, whilst fun is extreme.